A player's ranking is always between 0 and 1000. In each MERS tournament he can obtain a base rank between 0 and 1000. The player's total ranking is a weighted average of his obtained base ranks from the tournaments he has participated in. A player who wins all his tournaments, will have a total ranking of 1000. A player who loses all this tournaments, will have a total ranking of 0. MERS1 : and other (local) tournaments count only once. Also, player's older results count less towards his ranking, than his more recent results do. and when a result is over three years old, it will no longer contribute to the MERS. 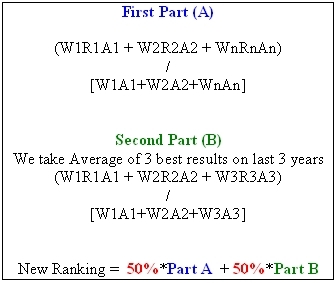 To establish a representative ranking five results are needed. A player is required to have participated in at least two tournaments to appear on the ranking and a player with less than five tournaments is given a result of 0 (weight 1) for each missing tournament. If you win you get a base rank of 1000. If you are in the middle of the field you get a base rank close to 500. If you are number 75 out of 100 you get a base rank of 252. If you are last of 100 players, you get a base rank of 0. Find the number of player's you have beaten by taking the number of players and subtract your position. Divide by (number of players minus 1). Then multiply by 1000 to avoid small numbers. Example: there are 100 players. Consider the player who got the 25th place. Base rank: (100-25) / (100-1) * 1000 = 757. Since July 12th 2010, rules change : It's composed by 2 parts. First part is made with average of all tournaments (in the last three years) and the base ranks he has obtained. Note that all tournaments are rated differently (with weight) and count less in the time. Second part is made with average of three best results (base rank) during last three years. Note that all tournaments are rated differently (with weight) and count less in the time.